We recommend sealants for children as soon as all four of their first permanent molars are fully erupted, usually between 5-7 years of age. When the second permanent molars erupt, these can be sealed as well. How do we care for my child’s sealants? Dental sealants should have a life span of approximately 3 years. To help your child’s dental sealants stay in place, make sure your child does not chew on anything hard, like ice or hard candy. We will check the dental sealants at your child’s regular 6-month dental checkups, and we can touch up sealants when needed. After 3 years, they may need to be replaced. 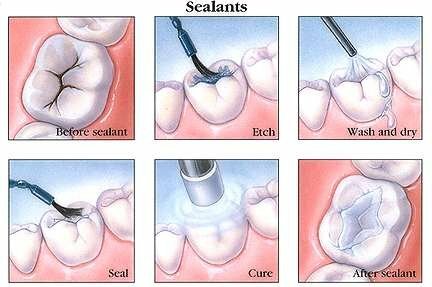 What is the success rate of sealants? According to the Comprehensive Review of Pediatric Dentistry (September 7, 2012), after 4.5 years the sealed permanent molar teeth of children ages 5-10 had caries reductions in over 50% of occlusal surfaces compared to non-sealed teeth; caries reductions ranged from 86% at 12 months to 57% at 48-54 months.